Project 600 – HubNut – celebrating the average! Rover 600: It’s dead. Next! Oh dear. That experiment hasn’t gone tremendously well then. After failing on Sunday, it has been confirmed that the Rover is dead. The differential blew itself apart on Sunday and, allied to the damage sustained during the subsequent recovery, it’s just not going to be worth sorting out. All a bit sad really. This one won’t ride again. Just 18 years old. The thing is though, I don’t appear to be that sad at the prospect of not driving the 600 again. I think it’s a classic case of me falling for the looks, which I still think are superb, but not really enjoying the driving experience all that much. Certainly, it reminded me that some suspension travel is well overdue in my life. The Nippa is bouncy. The RAV4 is bouncy. I really need something that is not bouncy! Especially while the smooth-riding 2CV is out of my life (paint due next month!). It is tricky to know what to get next though. Do I just buy another tired old snotter, or do I try to buy something actually nice? The good thing about old snotters is that if it all does go horribly wrong, there’s no massive sense of loss. But, I’m a petrolhead. Surely it’s about time I had a nice car? After all, I still believe it’s possible to buy an actually-nice car for under a grand. In fact, I feel I need to prove as much. At the same time, I’ve got a craving for something actually old too, though this gets more difficult. For a start, actually-old stuff doesn’t tend to be cheap. Unless it’s thoroughly rotten. Also, every car I own must be prepared to live outside, and be driven in all weathers. Some owners clubs might hunt me down for treating an old classic in such a manner. There’s also the fact that such treatment leads to rampant rot – see my 2CV for example. I’m still finishing off the next issue of Retro Japanese magazine at the moment, so I don’t have any time to go hunting for a new car just yet either. That’s ok. I’m not entirely sure what my budget is and I currently have two working cars at my disposal. It has been pointed out to me that it might be wise to do my tax return before splurging a load of cash on another car. I guess it nothing else, it’s good motivation to get it done! So, farewell Rover. I’m sorry it didn’t work out better. Today has not been a good day. 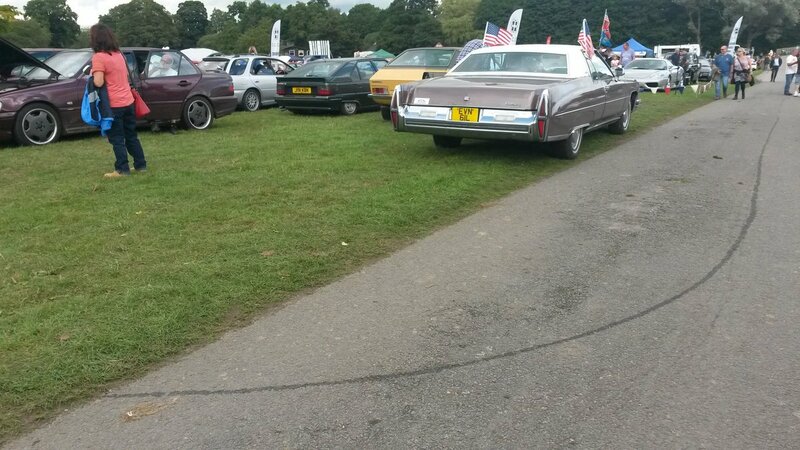 I was having a lovely time at the 1000 Classics event at Cholmondeley Castle, Cheshire, until someone pointed out that my Rover had a suspicious trail of oil leading to it. He was not wrong. 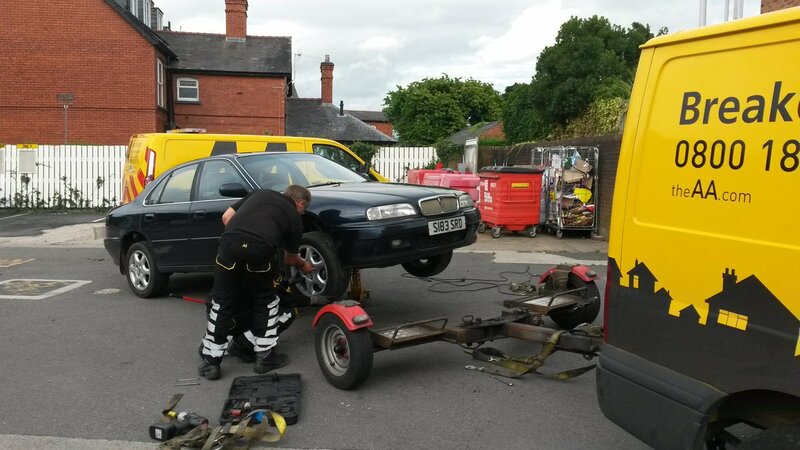 My friend ‘Junkman’ was quick to diagnose that the driveshaft seal had blown out of the gearbox on the nearside. Lovely! Then I remembered pulling out of a layby that morning, as we waited for a friend to catch us up after a nasty right hand turn. I pulled away swiftly, heard a strange noise and immediately decided it was best to ignore it. The noise went away. All was well. It was a few miles to the show, but I noticed when slowing down that suddenly I had transmission noise on the overrun that was not there before. I decided not to ruin by day by worrying about it now. Delayed worry is a thing. 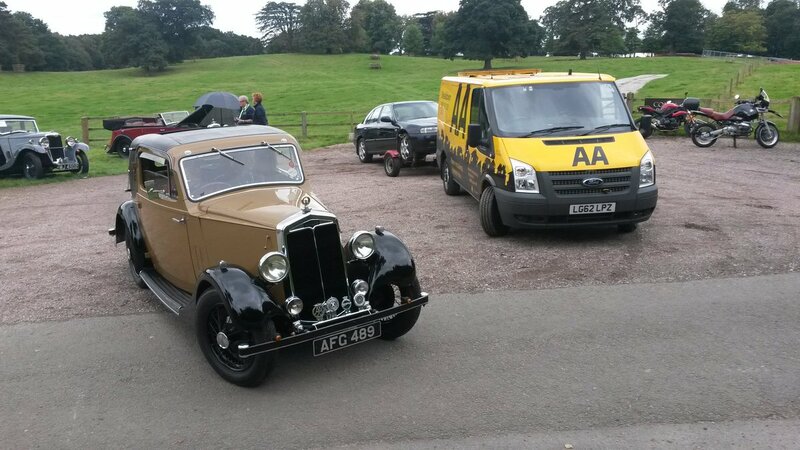 The AA turned up rather promptly. Annoyingly so given I still needed to conduct a photoshoot on a rather nice MX-5. That ended up being a rather hasty affair. I hope the pics are ok. Meanwhile, the Rover was strapped down to its great shame, in front of a row of perfectly working pre-war cars, such as this rather delicious Lanchester. 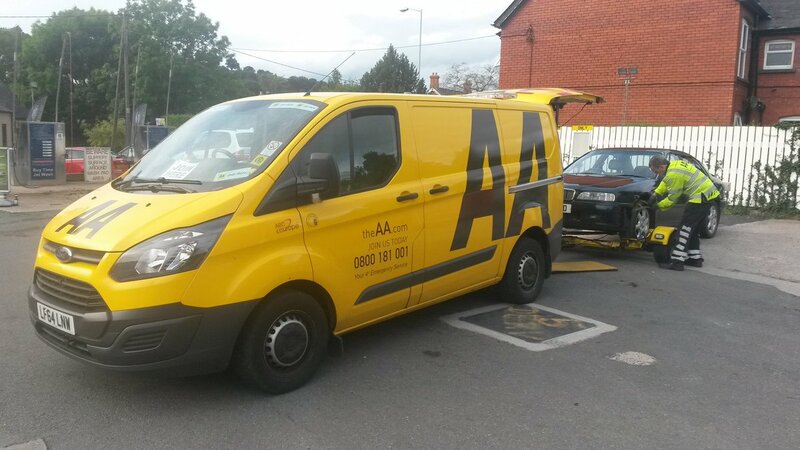 The driver admitted that he was running out of hours, so we’d need to transfer to another AA van. No worries. Until he tried reversing at the meet point. There was a big bang. Yup, the Rover had somehow jumped off the dolly. I delayed my anger at this point, as there was not much point being angry. It wasn’t going to help. Delayed anger is a thing. Getting the Rover off the dolly was a right game. It took over an hour. 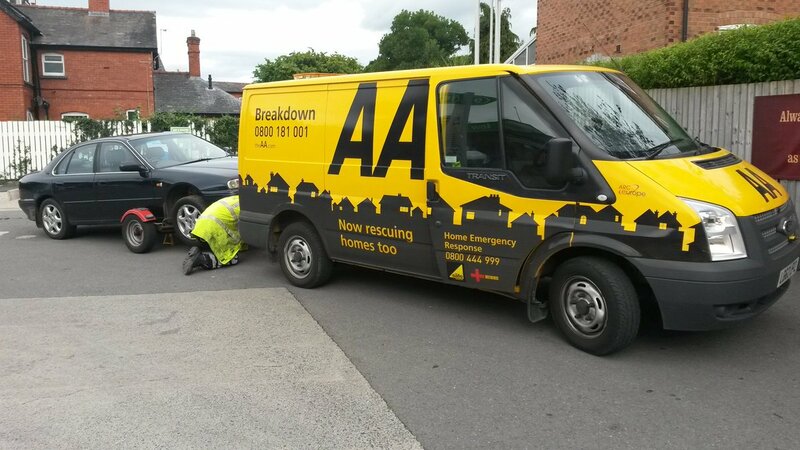 The second AA guy could have helped, if he had not been waiting for us (for half an hour) a short distance up the road. AA Sat Navs are rubbish. The rescue involved scary heights. However, eventually, the Rover found itself connected up to a much nicer Transit van. Some hours later, we arrived at my local garage where the Rover has been dumped to await its fate. (this shot is just after the transfer, it was dark when we got back to Wales). The Rover has been damaged by the fall, but I’m not sure how badly. The ‘chassis rail’ that runs below the driver’s floor has been squashed quite badly, and the plastic sill cover (badly scratched) may be hiding damage beneath. That rail already seems to have some rot in it. In addition, fitting the light board to the rear end seems to have damaged the bumper – the fitting has pulled out of the body on the nearside just behind the rear wheel. It was already weak. On top of all this, I’ve no idea if the gearbox has been damaged. I’m not sure what to do next. Sleep sounds good! I’m quite rubbish at buying cars. I was going to buy a Lexus, but somehow ended up with a Mitsubishi Colt 1500 GLX automatic. This was clearly not going to be the ideal vehicle for our upcoming holiday to France, so panic measures were resorted to. That meant heading to Ebay to see what was actually suitable for such a trip, and what was cheap. The Rover 600 was an obvious contender, the purchase of which I’ve already covered. Now, it was time to find out how it would do on the trip. Firstly, I decided to investigate the air conditioning. It wasn’t working, and a heatwave was forecast. I decided to ask my local garage to investigate, and they found a failed hose. There was no time to source a new one, but they reckoned a local agricultural firm could make a new hose with the existing connectors. All was going well until, the night before we were due to depart, the new hose blew apart. One of the connectors had not been sufficiently crimped. This was especially annoying as I’d actually dug my bicycle out of the storeroom and ridden it 4.6 miles to collect the car! The hose was swiftly removed and the garage offered to try and get it remade the next morning. I decided to take the gamble, even though that meant collecting the car on the day we were due to leave. The day of departure arrived and I got to the garage just as the new hose had been fitted. It was time to fire it up! Thankfully, the new hose held, and beautifully chilled air came out of the vents (after I’d previously fixed the blower motor). Fantastic! I said my thanks, drove back home, we loaded the car and headed off to our overnight stop in Sussex. It was already pretty sweltering, so I was glad of the air con. It truly transforms a motorway journey in the summer, because you can keep the windows up. That makes it much, much more peaceful. We even managed to listen to music at a reasonable volume. Perfect. However, our joy was not to last. During the latter stages of our trek along the M4, I began to notice that horrible hot-electric smell that suggests all is not well. It reminds me of model railways, when dirt is making it difficult for the voltage to get through to the wheels. Sure enough, when we hit traffic on the M25, it became apparent that the fan was not actually spinning – the cool air had merely been a result of the ram air effect of travelling at speed – or perhaps that ram air had been helping the fan to spin. Either way, it was back to windows down. I did briefly consider trying to strip the motor out at my sister-in-law’s house, but decided eating dinner was a better idea. I also didn’t fancy having a car in bits hours before our chunnel crossing. Noisy windows it was then – at least it was cool on the eurotunnel train! We then had several hours of French autoroutes to contend with, and it was noisy going. Until I decided to just run the air con with the ram air effect. At 130kmh, this worked very well and we were kept at a comfortable temperature. It only fell down whenever we stopped. There followed a few days of family, too much delicious food and much sitting around before I got a chance to get the fan motor out. Essential holiday antics – fan blower motor removal. Removing the fan quickly revealed that all was not well. It was reluctant to turn and indeed, was refusing to do so entirely without a little assistance. I recruited my father-in-law to investigate, as I knew he’d enjoy the project. With the motor apart, we could see the problem pretty clearly. Trying to revive the motor with a clean-up. That’s some pretty drastic wear on the commutator. That step at the end of the brush should not be there. The brushes too were pretty worn. We were hardly going to find replacements in the middle of rural France on a Sunday afternoon, so a bottle of meths was provided, and we settled for just cleaning things up as much as possible. That included using a cocktail stick to clean out the carbon muck between each of those segments to reduce the possibility of short circuit. The brushes act on each of those segments in turn. I also cleaned out the nose bearing and the guides the brushes sit in, to ensure they could move freely. With that done, I then reassembled the motor and a bit of machine oil was added to the nose bearing. With some scepticism, I plugged the motor back into the car’s loom and prepared to turn it on. Well, I was glad I’d got a firm grip of the motor housing, as the difference was staggering! It had gone from a lumpy, reluctant rotation to generating so much torque that it threatened to rip itself from my grasp! I looked all dramatic as the huge movement of air blew my hair backwards. This was a proper little wind machine. Now all I had to do was reassemble everything, which I did with only one screw remaining. I’m clearly getting better at this lark. The next day, we went sight-seeing and enjoyed beautiful air conditioning once again. Lovely! Of course, it didn’t last. The next day was even hotter, and having left the car parked all day, I moved it to a better position for loading up, prior to our long drive home. I turned on the air con, but the vents resolutely refused to chuck out air that was very cool. Sadly, that continued for our drive home. The pump was kicking in, but the air conditioning unit merely made a wheezing sort of a noise and no cold was forthcoming. Bother! Things got even worse at the Eurotunnel entrance, where British security checks were causing a major hold up. We queued for ages, at the hottest part of the day, with not a cloud to be seen. Feeling hot. V8 Mustang sounded nice though! It was pretty much unbearable, though things improved when we opened both front doors. There was hardly a breath of wind though. Seriously sticky. At least the train was a little cooler, and it was also a fair chunk less scalding in Dover too. Phew. It got a lot hotter soon enough though, with the M25 being pretty bad. I knew there was a weather front heading along the M4 though. If we kept going, perhaps we could meet it! As we headed towards Wales, things became cooler still. We eventually arrived home at just after ten pm, having covered well over 500 miles that day, and some 1200 miles in total. And here’s the thing. While the air conditioning certainly played up, the rest of the car just did what a car should. I drove it at 70-80mph (80mph=130kmh on the Frenchside) for hour after hour. It had to queue in major jams (Calais and M25). It never overheated, it never needed a drop of fluid. It was all quite boring really. In fact, if it weren’t for the air con related woes, it would have been a thoroughly boring experience that would hardly have been worth writing about. It just proves that £230 really can buy you an entirely capable vehicle. I still reckon it looks superb too. It may not be a Lexus, but it might just be the best value car I’ve ever bought. Resting in the heat at the French services. What a car! Yesterday, I took my Rover to the local garage to explore the world of air conditioning and to get the dodgy tyre replaced. Tyres and air con. Improving my steed. The air con pressure tester revealed a leak somewhere, and sure enough, the hose between compressor and condenser had a small tear in it. Well done machine. Living in the sticks has serious downsides at this point. We weren’t going to find a Rover 600 air con pipe just sitting on a shelf somewhere. So, the lads decided to employ the services of a local agricultural merchant. After all, they make hoses for tractors that carry serious amounts of hydraulic pressure. This should have been a doddle. This afternoon, the pipe was being refitted. With Rachel out picking billberries (she has the blue teeth to suggest not all ended up in her basket…), I was forced to seek other transport solutions. Er, is this really a good idea? I was given this bike by an optimistic aunt and her partner back in 2010 or maybe 2011. I’ve ridden it ONCE since then, before deciding such antics are best avoided. I’ve certainly never tried riding it beyond the borders of our village before, and as I made the bold attempt, I remembered why. I couldn’t even make it up the gentle hill that takes you out of the village. FAIL! I bravely kept going though. I needed to get to the garage before it closed for the day. Sure, I had to walk at times, but I was still moving. Finally, I reached the section which is about a mile downhill. I barely needed to brake, even on the steep bit. If you watch the cycling on the olympics, you’ll see that the men shave their legs. I think that must explain it. I don’t. I was creating massive drag. I made it halfway up the steep hill the other side of this drop before giving up and walking, but after ‘just’ 30 minutes, I’d manage to cycle 4.6 miles. SUCCESS! Made it! Too knackered to account for sun position. You’ll note that the bonnet is still up at this point. The news was not good. The bolt holding one end of the pipe in place had brought a chunk of aluminium thread out with it, so the lads were tapping it out and then had to make a replacement bolt. They’re nothing if not ingenious – as you have to be when the nearest town is 12 miles away, and probably won’t have the bit you need anyway. Finally, they got it all back together again. I fired up the engine, the compressor clattered into life for the first time in a while, and the vents became cold. Oooooh! Lovely! Then things went a bit wrong. I could see nervous faces below the raised bonnet from my position in the driver’s seat. BANG. Suddenly, refrigerant was escaping at high speed, men were running away and I was shutting the engine off. Balls. One of the fittings on the new pipe had simply blown off under the pressure. This was not part of the plan. So, what to do? We depart on holiday tomorrow. The agricultural place opens again at 8am. I decided to risk it. The lads will attempt to get a new pipe made up, and I’ll have a nervous wait in the morning before driving to our overnight halt in Sussex. I didn’t much like the idea of cycling back home – there are even more hills, some of them very steep – so I was loaned a Clio. I had got as far as trying to get the bike into the Rover – it doesn’t fit. Happily, the Clio had no objections! So, the car we’re going on holiday in tomorrow is still not ready. This promises to be fun! Neither of these will be taking us to France. It’s been a while since I had a weekend to just spend at home, but thankfully, I had one just when I needed it. The Rover needs some fettling before our foreign holiday, starting with trying to reclaim that sodding indicator bulb! So, I stuck a bit of high-tack aluminium tape to the end of a screwdriver and went fishing. At about the third attempt, success! Hoorah! Managed to reclaim the lost indicator bulb. Now I had to test the bulb to see whether it had failed, and I’d simply dislodged it when trying to remove the bulb holder, or if the bulb had just somehow fallen out of its own accord. Here’s the answer. Huzzah! The bulb does work. It must have somehow fallen out of the holder then. Very odd. And yes, it is stupid to rest spanners on a battery with exposed terminals. I accept your point. There was one more job to attend to before I departed on a milk run – refitting the side indicator. I used blutack for this, but I doubt it’s going to last long. Side indicator bodge. A common fault it seems. I was now ready to go and fetch some milk. Quite why I ignored the three fully-functioning vehicles I had on my driveway, I’m not really sure. I guess new-car-excitement is alive and well. Encouraging. Once my fast had been broken, I set about trying to fix the non-working heater fan blower. Now, there are a few common faults here. One is the resistor pack, though failure of this usually means one or more speeds don’t work, but the fastest speed still will. Relays are another potential failure, or it could be a simple fuse. Fuses were ruled out quite swiftly, and I didn’t reckon the resistor pack was likely. So, I decided to remove the fan assembly, having read that it was quite easy to do. Easy! Fan motor assembly removed. Removing the glovebox requires you do undo two screws, a few more remove a reinforcing bar and then a few nuts and bolts hold the assembly in place. You’ll notice the multimeter, though I was testing in the wrong places, so assumed power wasn’t getting to the fan. I tried spinning the fan by hand, but it felt reluctant. It would turn, but very swiftly stopped. Could this be my problem? I turned on the ignition, switched the fan to the high setting, and used a screwdriver to turn the fan. It kept turning, slowly getting quicker and quicker. By heck can it move some air once it’s up to speed! I wasn’t happy with this ‘fix’ though, so I turned the ignition back off again, disconnected the wiring and pulled the assembly apart. I couldn’t see how to get the motor fully apart, but could remove one end. That revealed a gloopy mess inside, carbon dust from worn brushes being the main problem. I used my high-pressure penetrating oil to blast out the muck, and then applied spray grease to the bearings. The oil may have been a mistake. I’m pretty sure it contains fish oil, and the car now whiffs of it. I plugged the wires in, and the fan speed now seemed much quicker. Speedy fan! It just needed a clean out and lube. Then it was a ‘simple’ job of refitting everything, while listening to Jonathan Agnew interviewing Ade Edmondson on Test Match Special. Getting the fan assembly to engage with the air con unit was a bit of a struggle, but I got there in the end, with only two screws left over at the end! Sadly, it seems the air conditioning is not working. It could be that it is simply in need of a regas. I can hear it kicking in, but the vent temperature is not very low. Given that there’s a heatwave coming next week, I think air conditioning might be nice to have! Mind you, another priority has revealed itself ahead of this trip. I’m very annoyed with myself for not checking the car more thoroughly before I left the seller’s home, because it turns out that one of the tyres is horribly worn and aged. Sheesh! This is a very dangerous tyre. I did check the front tyres, even getting the pressure checked in one of them before I left. The front have decent treat, as does the offside rear. The nearside rear, not so much! Look at the state of that. It’s appalling. It gives me the shivers to think that I was driving at motorway speeds on this. At the very least, I was risking a sizeable fine and points on my driving licence. But, that tyre is clearly beginning to perish. The results of a blow out at motorway speed, or when cornering, do not bear thinking about. I’m very annoyed with myself, as I take tyre safety very seriously. Or I thought I did. Let this be a lesson to all of you! Check your tyres. New Rover: What’s it like? Apologies for the radio silence. Things have been rather busy of late. However, the new Rover has been collected. It didn’t make for a particularly exciting collection caper though. I handed over £230, drove it to London, stopped the night, actually had to put some fuel in it, then drove back home to Wales. The only problems were both indicator related – the offside side indicator fell out of the wing (it had obviously been glued in after failing before) in the final few miles, and the nearside front indicator bulb fell out of its housing (and then into the lamp where I couldn’t retrieve it) somewhere around Gloucester. So, what of the car? First, some boring geekery. 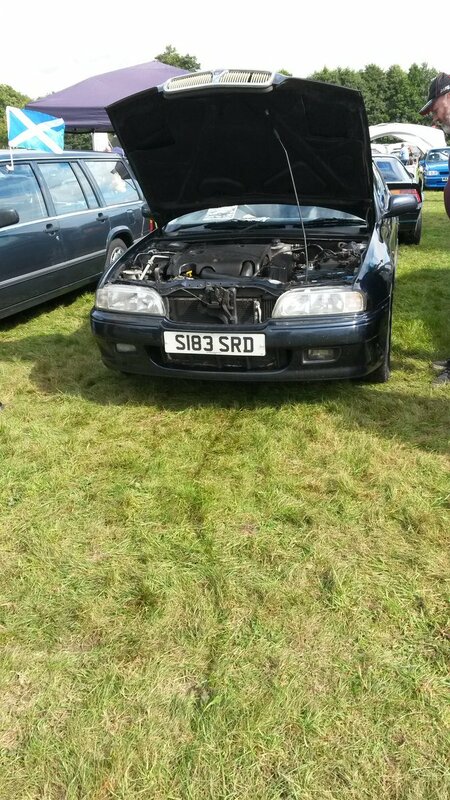 The Rover 600 is very much a Honda Accord. No surprise there, as most of Rovers cars at this time had shared development with Honda. Here’s the thing though, of all the Rondas, the 600 was the one that Rover had least say in, under the skin at least. Honda didn’t want to mess with a successful formula, so Rover were pretty much restricted to styling tweaks. What tweaks they were though! Here’s a Honda Accord of this period. The 1995 Honda Accord yawnfest. Bland is the key word. The rear end is even worse. A featureless rump that has absolutely no design interest whatsoever. Now, Rover had a challenge. It had to use the same basic structure as this, with the same windscreen, roofline and even the front doors. Yet somehow, designer Richard Woolley came up with this marvellous design. Frankly, I consider the 600 one of the best looking Rovers of all time. I rate it ahead of the 75, which always looked a bit bulky to me – and the front indicators were always odd, or even ugly. I may concede that a P4, 5 or 6 win it, but move into the 1980s and 1990s and there’s simply nothing to touch it. In my opinion. Under the bonnet, there’s a further step away from Honda as Rover’s own L-Series turbo diesel is fitted. This is a rather fine evolution of the old Perkins Prima, as used in the Maestro and Montego, but now with electronic control of the throttle – albeit with a cable still involved. It’s a bloody marvellous engine, with practically no turbo lag at all. It pulls very smoothly indeed from just 1000rpm. Honda actually started to use this engine in its own cars. It is very good – I’d rate it as even better than the 2.1 turbo diesel in my old XM. It isn’t as powerful though, a shade over 100bhp in quite a large car. It never feels slow though, just not neck-snappingly brisk. The steering is good too, though it was some hours and well over 150 miles into my ownership until I really got to exploit it on entertaining terrain – ie Welsh border country. It turns in very nicely and doesn’t have the worrying nose-heavy feeling of the XM. Looks nice from behind too. It ambles along beautifully at motorway speeds too, which is good. Frankly, the only reason I have bought this car is because I need something good at motorway speeds. I’ve only used quarter of a tank of fuel so far (65 litres, 15 smaller than the XM), so I’ve no idea what the economy is like. Pretty bloody good is my best guess. I must concede that I’m not entirely won over by the colour either. These cars actually work well in lighter shades. I would have liked a sunroof too, and that was made even more desirable by the non-working fan blower motor and therefore non-working air conditioning. I’ll include something about that in my next report. The gearchange isn’t the best either. I know bits on this one have been replaced, so it feels nice and tight, but it is also heavy in operation. It’s not great for quick changes. But mostly, this story is all about the positives. The Ti-spec seats are a touch firm perhaps, but I got out after six hours at the wheel with no notable backache. There is a flick wipe feature. I can listen to Test Match Special on long wave radio. There is a foot rest (something I always longed for in the XM) for your left foot. I also got a ton of history with the car, including the owner’s handbook. Frankly, it seems utterly ridiculous that such a good looking, competent car can be bought for so little money. Rover 75s attract plenty of enthusiasts, but the 600 remains overlooked. Having owned both, I know which I prefer already.